Bridge 7498 is a three-span, concrete, cast-in-place deck-girder structure constructed atop the Lake Bronson Dam. It carries County State Aid Highway 28 across the western tip of Lake Bronson and the south branch of Two Rivers in Kittson County. The bridge was constructed in 1936-1937 by the Works Progress Administration as part of a water conservation and flood control project designed by the Minnesota Department of Conservation. 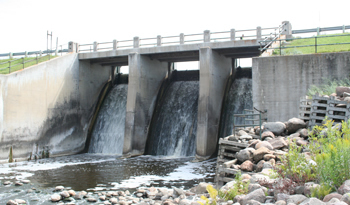 The combined dam and bridge structures remain significant for their association with the Federal Relief project at Lake Bronson, and as a contributing feature of the Lake Bronson State Park Historic District. Design and construction of a reinforced-concrete girder bridge across, and integrated with, a reinforced-concrete dam structure. Decorative rail with concrete posts and metal bi-rail. Setting within the Lake Bronson State Park Historic District, with Two Rivers to the west of the bridge and the impounded water of Lake Bronson to the east.